The cutest dog in the world, well till I find mine! Ok so yes I am a bit dog obsessed. I cannot wait till the day I am settled in a house, be it London or LA, and be able to buy my dog. I have wanted one for years and have been able to resist due to the pure fact of wanting to be fair and a great owner and not having one till I have the ability to properly look after him/her. As I’m still not sure whether I will be in London or LA this time in 6months (which has been the case for a few years now) I just don’t think it’s fair. 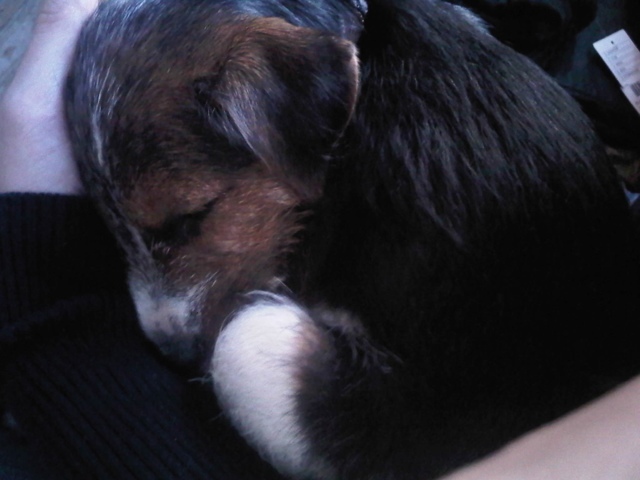 On the Harvey Nicholds job last week Lucy the stylist brought along her new pup Emily. I fell in Love instantly! She was manic but when she came and found me she seemed to want to settle down on my lap. Apparently I have a calming effect on Dogs. A huge love of my life Domino( a dopey Dalmatian) was the same. Maybe they sniff my manicness and come to calm me. Either way, it melts my heart. Just thought I would share her cuteness with the world.